It was not a picture prefect weekend in Charlottesville, but it was still pretty great. It remained slightly overcast, was a little chillier than expected, but everything was in bloom and that made me happy. This relaxed poplin shirt from Everlane has quickly become a weekend staple. 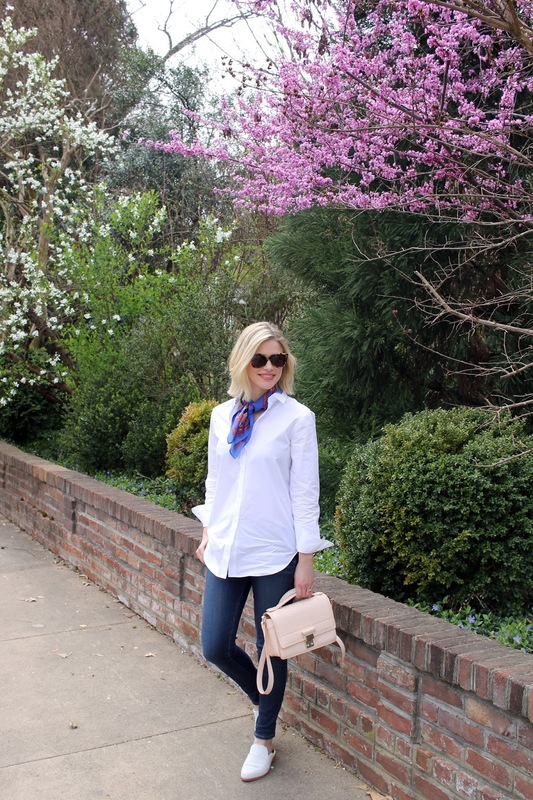 I love wearing it with jeans and flats for a more pulled together look than just a t-shirt. 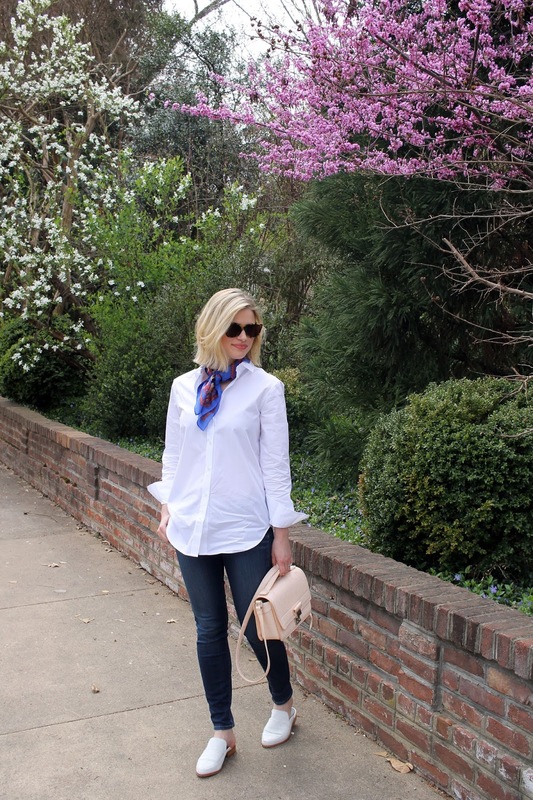 Add a simple silk scarf for a little color and I am ready for a afternoon spent exploring the city. Of course, this shirt is not limited to weekends only. Pair it with a midi skirt and heels for a more work appropriate look. 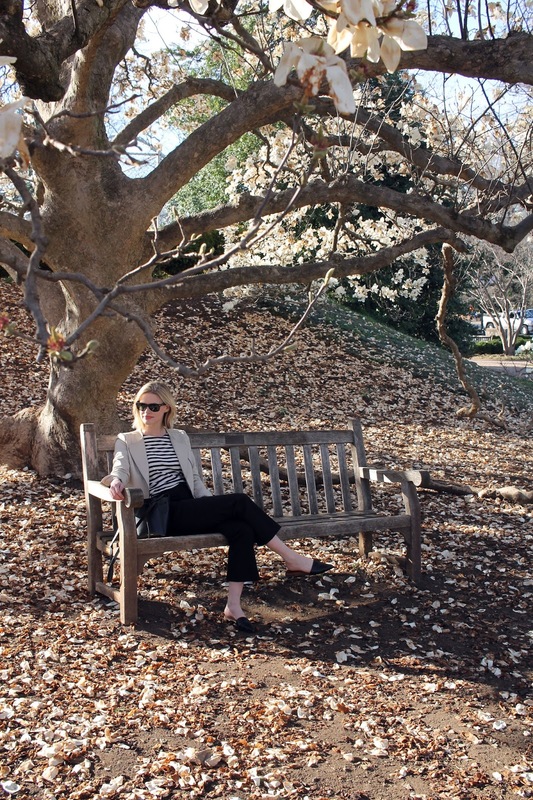 I've confessed my love for spring over and over again. I love the sense of rebirth this season brings with everything coming back to life. Watching the trees bloom has me wanting to give my closet a bit of a rebirth as well. I've felt particularly inspired by Pantone's Color of the Year choices, serenity and rose quartz. 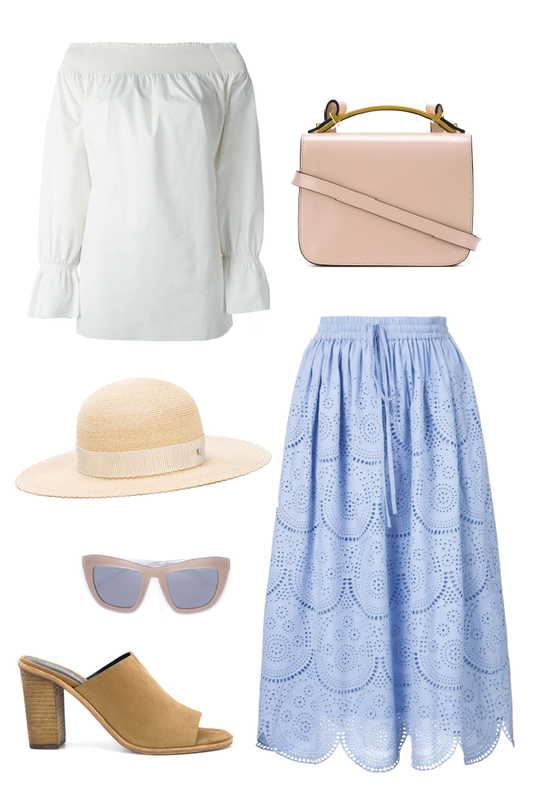 The light and airy colors are a perfect choice for spring. Right now, I'm craving off the shoulder blouses and midi skirts. Pair them with a pink bag and you are ready for a warm spring day. 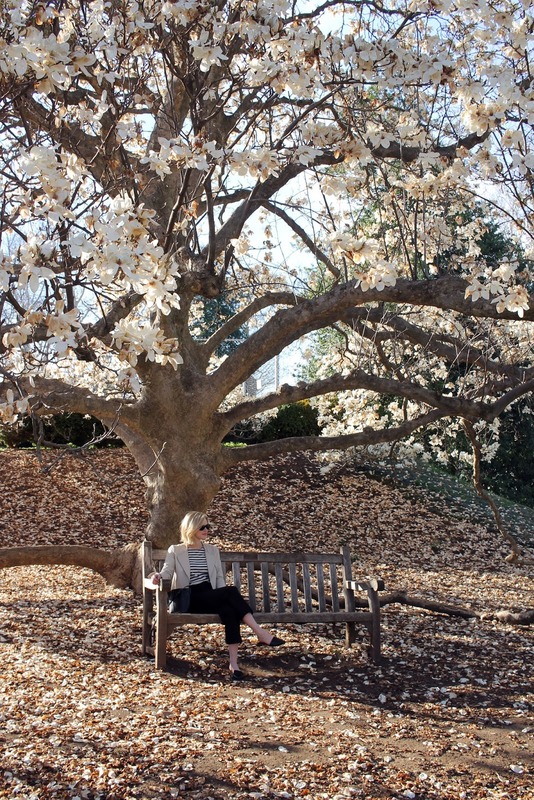 Charlottesville residents love to gush about fall. 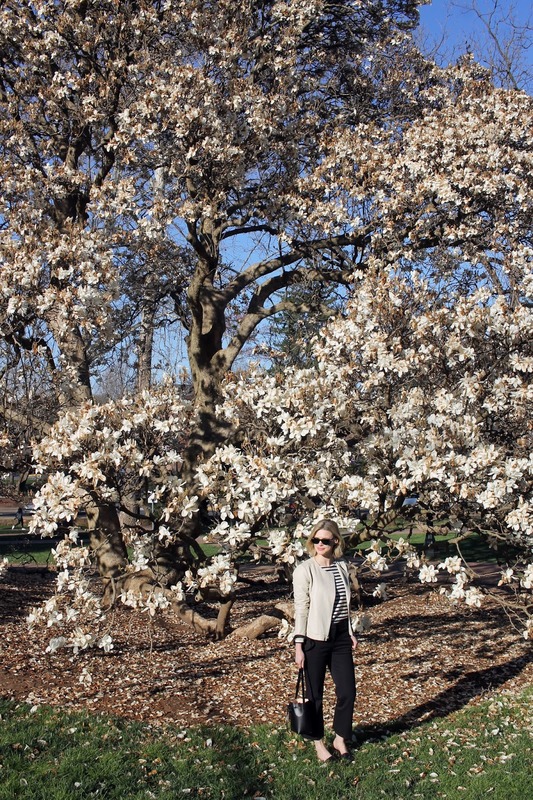 Everyone is quick wear their sweaters, go apple picking, and admire the changing leaves, but I am all about spring. 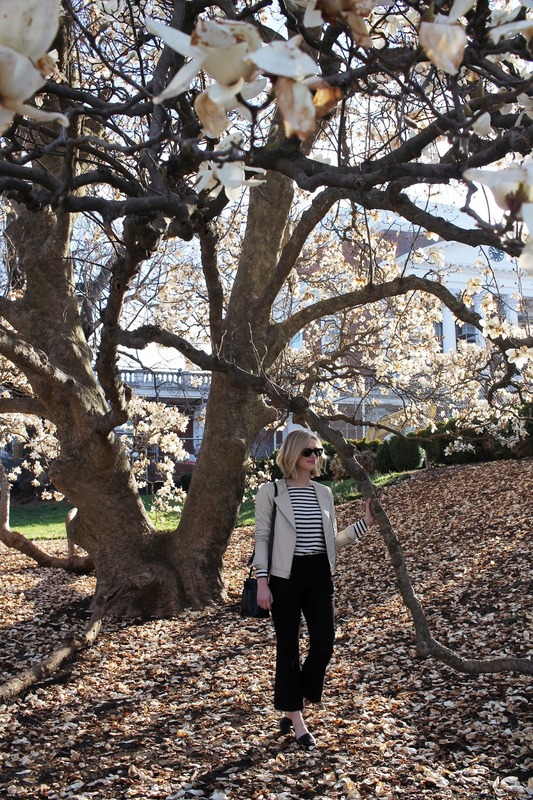 It has always been my favorite season, and spring in Charlottesville is particularly beautiful. Everything seems to bloom at once bringing the city back to life. This gives me an extra pep in my step, and has me ready to show some ankle. 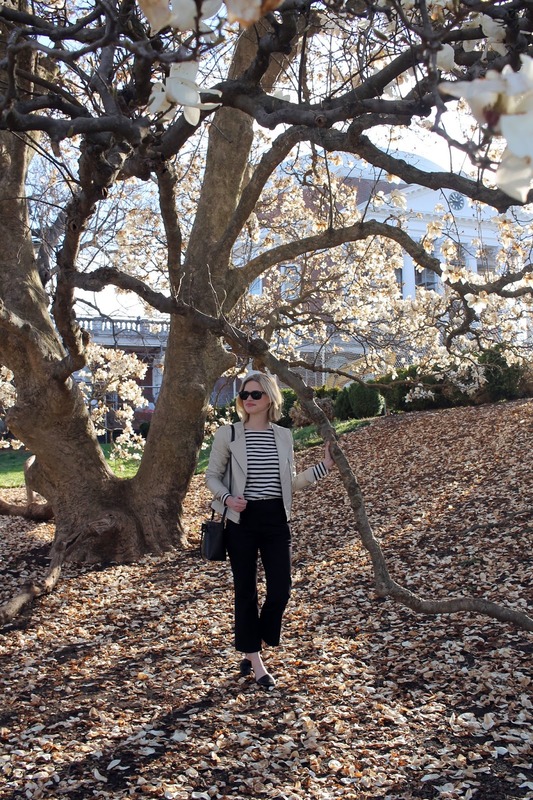 I finally caved and bought a pair of cropped flares, and they are turning out to be the perfect spring pant. 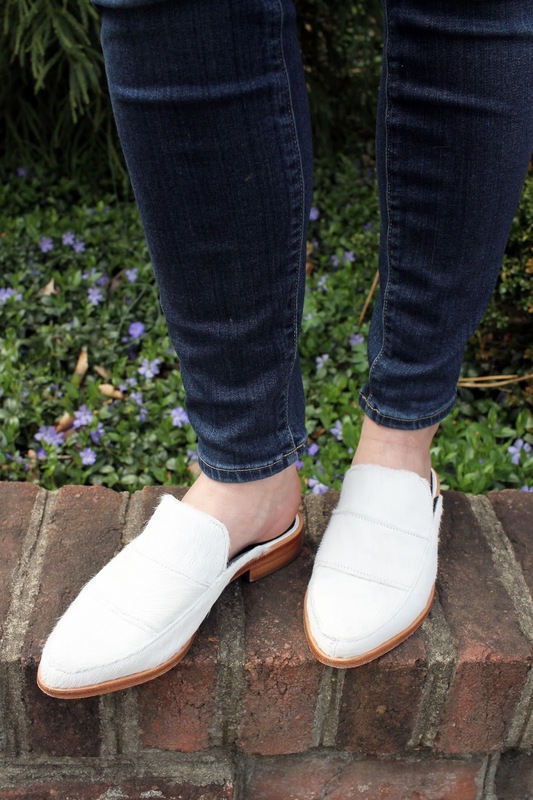 The little kick of ankle keeps them fresh when paired with flats or sandals. Throw on a striped tee and you are ready to conquer a lovely spring day. There is something comforting about making pancakes on a cold winter morning. The dense, rich batter, warm syrup, and hot coffee all pair nicely with my furry slippers. Because of this I rarely make pancakes outside of the November through February time frame. 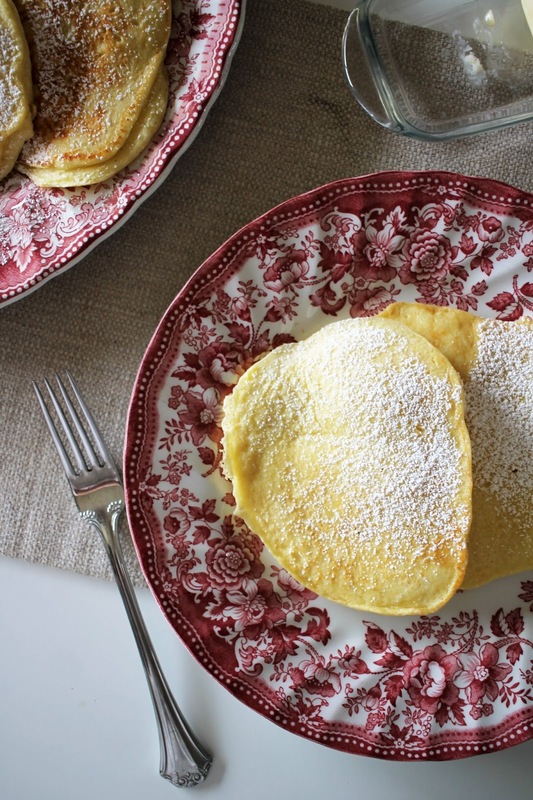 Warm pancakes don't have the same allure on a toasty July morning, but there is still enough chill in the air right now to enjoy a fluffy pancake on a weekend morning. This recipe is great for this transitional season. 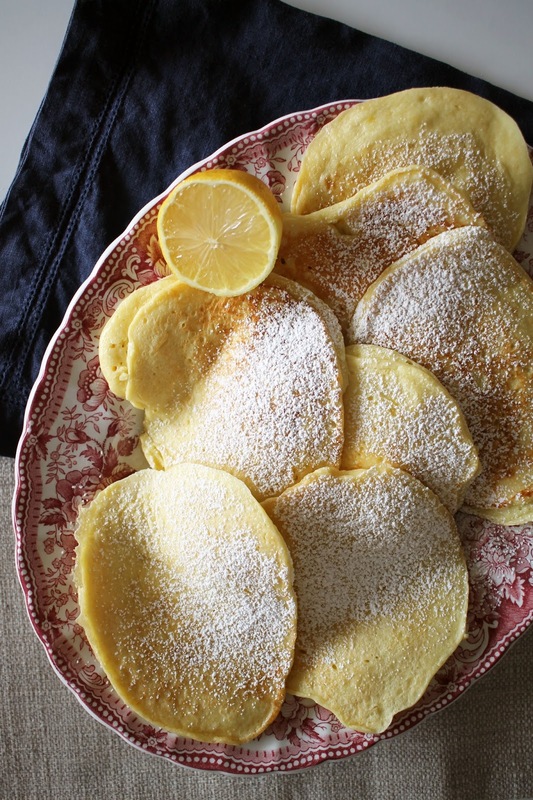 The lemon and ricotta brighten up the dish, but they are still pancakes so you get that warm and cozy feeling while indulging. Whip them up for your friends and family this Easter Sunday, and hopefully it will feel like spring. Whisk together ricotta cheese and yogurt. Add in egg yolks one at a time until mixture is smooth. Set egg whites aside. Stir in sugar, flour, baking soda, lemon juice, lemon zest, and salt until blended together. In a separate bowl, whisk egg whites until soft peaks form. 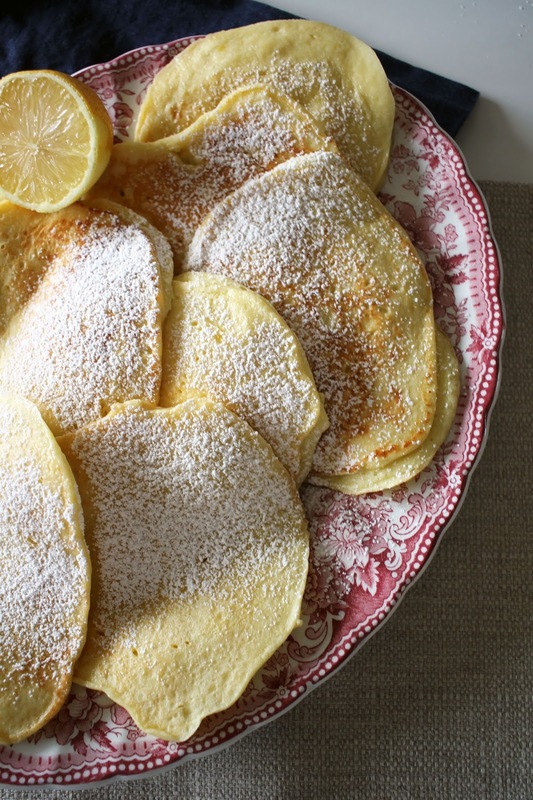 Carefully stir egg whites into the pancake batter. Mixture so should look light and fluffy. Melt about 1/2 a tablespoon of butter in a non-stick skillet over medium heat. Spoon about a 1/3 cup of the pancake batter in to the hot pan. Cook until pancakes just begin to turn golden. 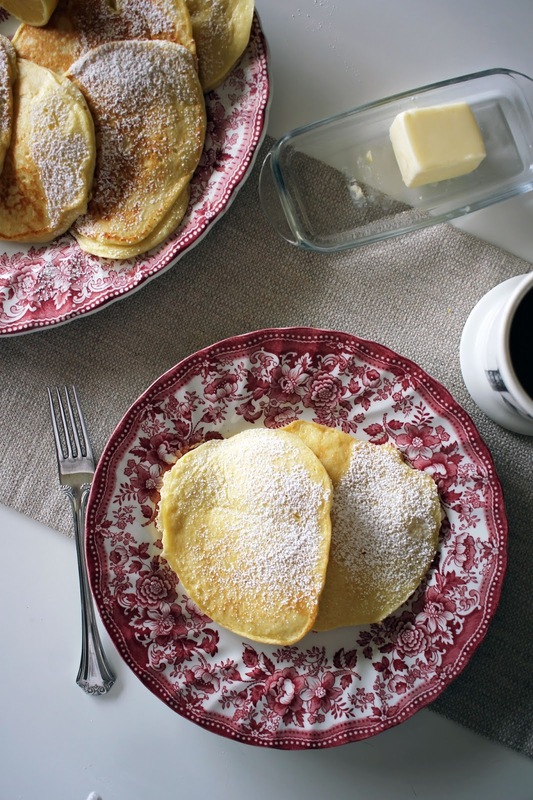 Serve warm with powdered sugar. There are few items of clothing room iconic than the trench coat. I've had the same trench coat since college, and I still wear it regularly. Most think of wearing them during the spring, but they are a seasonless piece that can we worn with almost any outfit imaginable. A classically cut trench is a great option, but I am loving the cropped, swingy styles popping up this season. They would look great with anything from cropped jeans to a simple dress. I am particularly found of this style which is under $50. 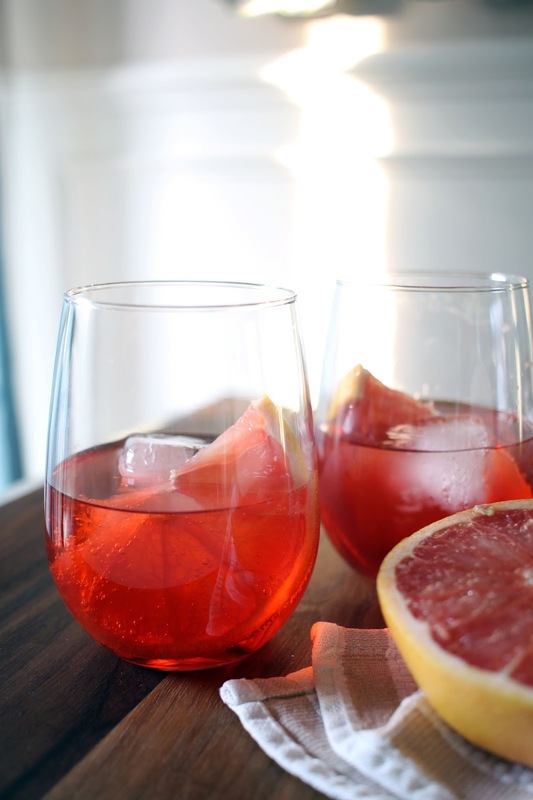 My love for campari is only growing stronger. After a bit of an obsession with negroni's I had to try campari in another form. 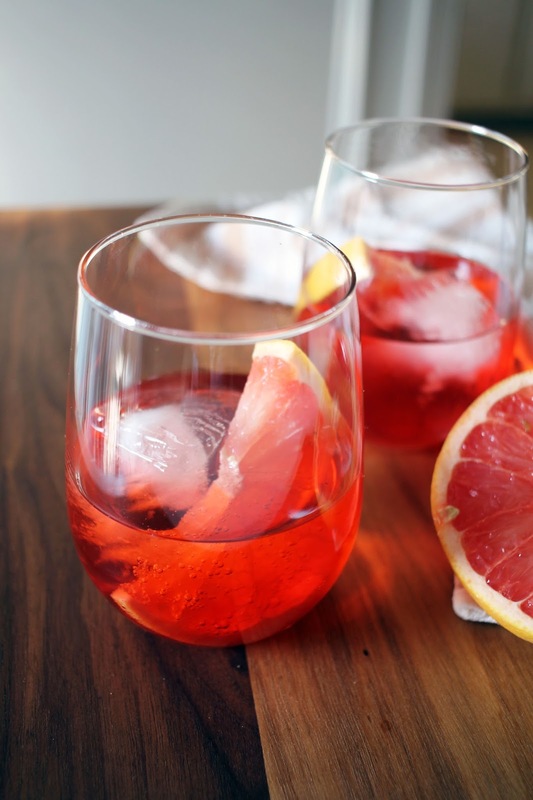 This spritz is light, refreshing, but still gives that bitter kick I love. It goes well with dinner and is equally delicious alongside an appetizer. This gorgeous spring weather has me wanting to enjoy them outside on our patio. 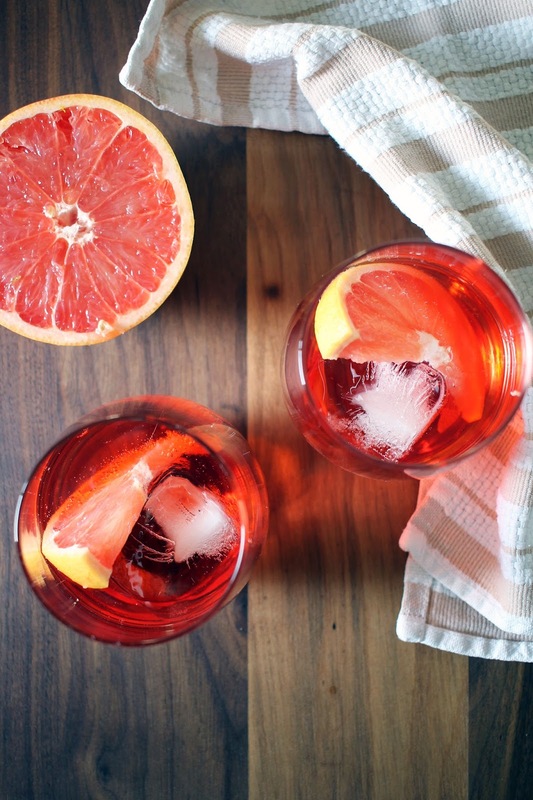 So, if you need me after 5 pm you'll know where to find me with a spritz in hand. Place one large ice cub in the bottom of each glass. 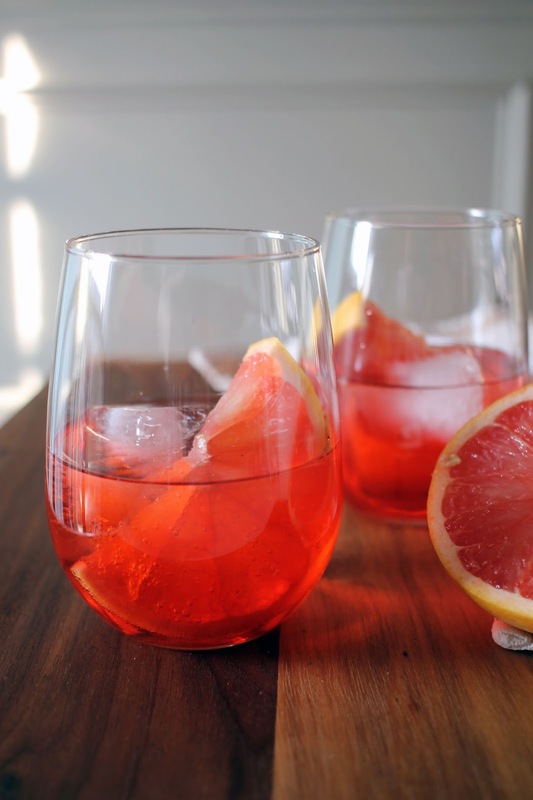 Pour 2 ounces of campari. 2 ounces of prosecco, and 1 ounce of sparkling water in each glass. Stir lightly to combine. Garnish with a grapefruit wheel. The recent time change has me ready for spring. I'm ready for Saturday mornings spent at the farmers market, dresses worn without tights, and most importantly spring produce. I jumped the gun a little with this salad, but the warm weather and longer days had me craving something fresh. 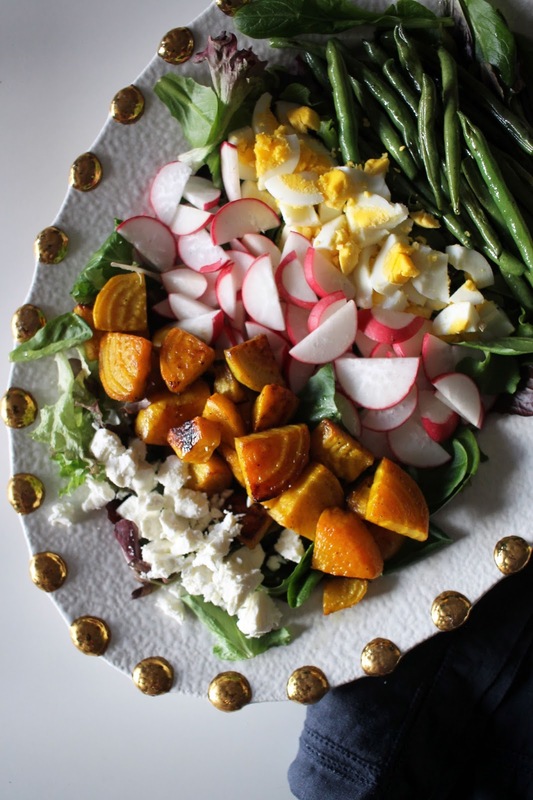 I love cobb salads, and I try to make them as seasonal as possible. Roasted beets and green beans give this vegetarian dish more substance, and the the shallot and lemon juice vinaigrette add brightness. 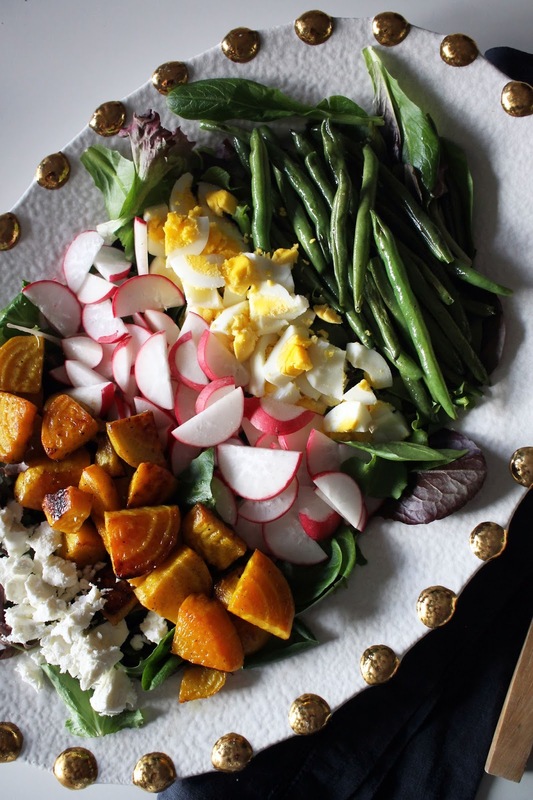 I know I'll be making this salad for the remainder of spring. Preheat oven to 425 degrees. Place beets and green beans on a large baking sheet and toss with a little olive oil, salt and pepper. Keep the vegetables on separate sides on a baking sheet a place in the oven. After 3 minutes rotate the vegetables, and after 5 minutes remove the green beans and set aside to cool. Place the beets back in the oven and continue to roast for 20-30 minutes until the are fork tender tossing every 10 minutes. Once cooked through, set aside and allow to cool. Place eggs in a small saucepan filled with water. Bring water to a boil, turn off heat, and let steep for 10 minutes. Remove eggs for the water and allow to cool. Remove shells and dice. Set aside. Whisk together shallots, lemon juice, olive oil, and salt and pepper to taste. Set dressing aside. 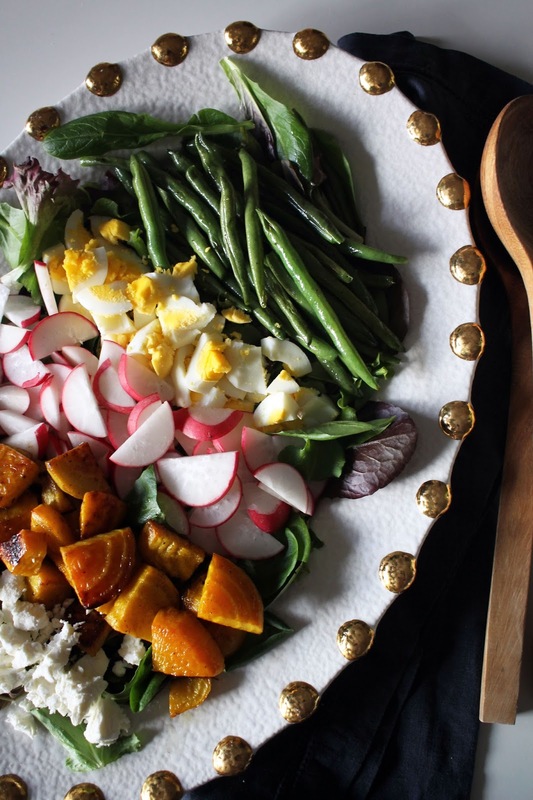 Place spring salad mix on a large serving platter. 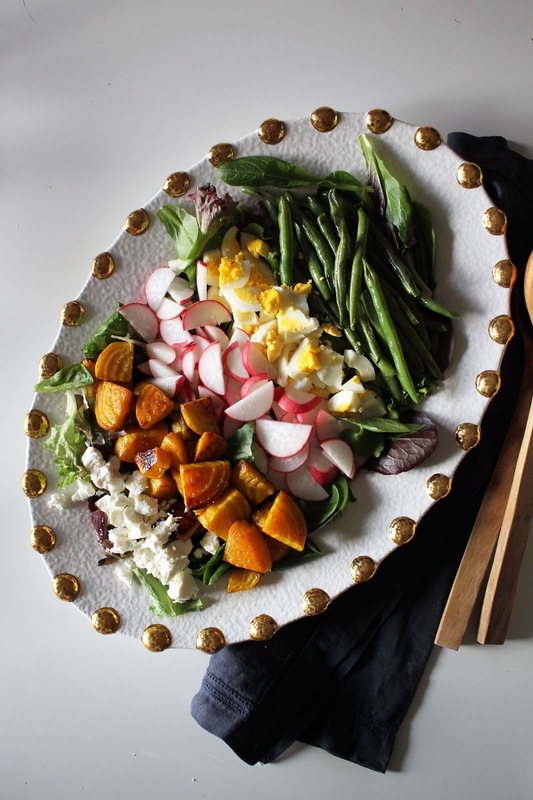 Top the salad with beets, green bean,s radishes, eggs, and goat cheese. Serve with dressing on the side. 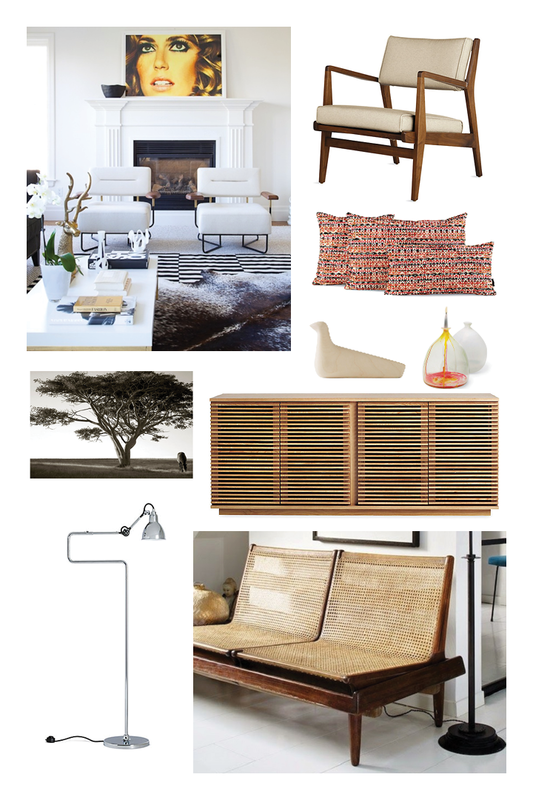 I would never label moving as fun, but day dreaming about new furnishings is just that. We're headed to Charleston at the end of the summer, and I am already planning our next apartment. I want our place to have that classic Charleston look, but with a touch of our modern style. The first thing on my list is new arm chairs. They help anchor a living room alongside the couch and can bring great personality to a room. I love a matching pair side by side, and I am hoping I have enough space to pull it off. I've been gathering pieces in preparation for our move (because I have a problem), but have yet to make any big purchases. Thanks to this sale I may have to pick up a few pieces in advance. Because how can you turn down a good sale? This post was sponsored by Design Within Reach. All opinions are my own. 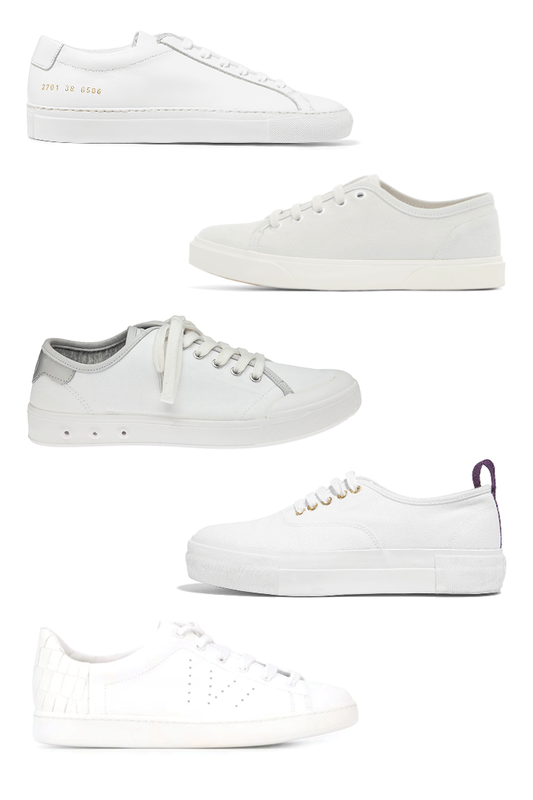 Another day, another shoe obsession. The athleisure trend is not one is was particularly drawn to. After spending my entire college career practically living in leggings I needed a break from the casual sporty look, but after seeing sneakers pop up season after season they are starting to wear on me. I doubt you'll ever find me in a pair of nike high tops, but a pair of simple white sneakers is fresh for the new season. I'd wear them with a pair of cropped jeans or a simple striped dress. I love this pair, but it is hard to commit to that steep price point. For now, I'll continue to lust after this trend while to try to fine a pair more inline with my finances. 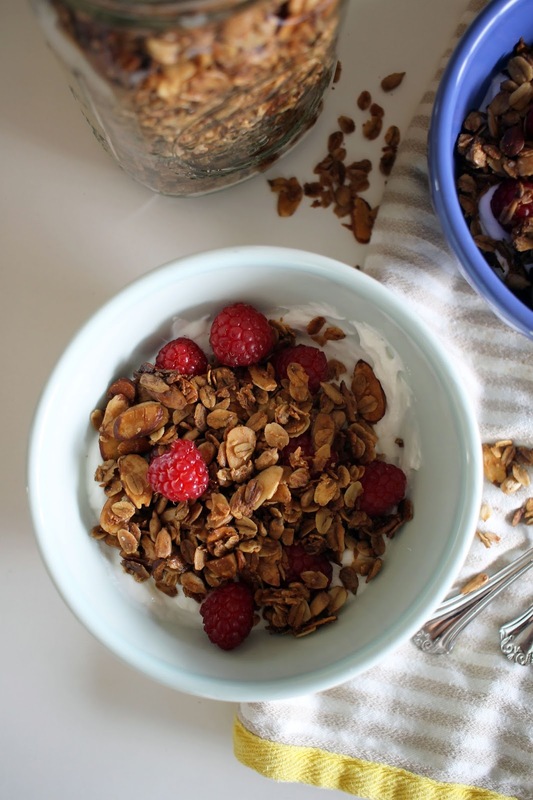 Granola, yogurt, and berries is my go to breakfast. It is quick, healthy, and keeps me full throughout the morning. 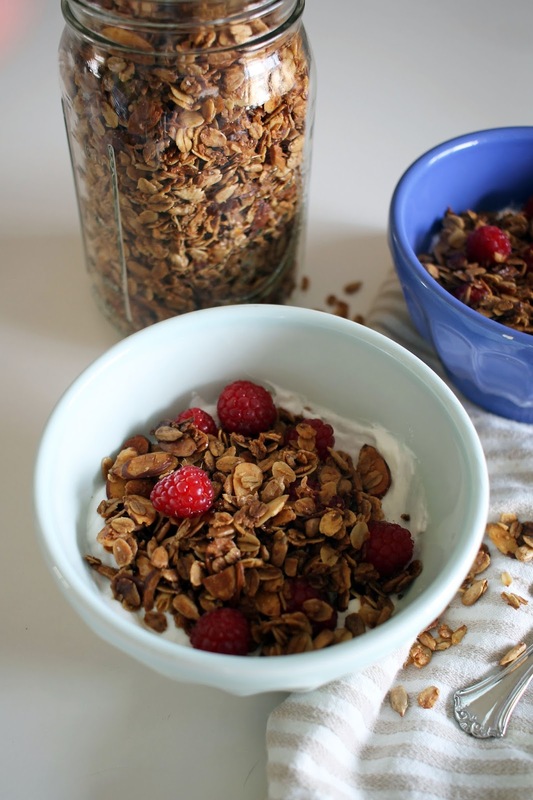 I typically top my yogurt with a store-bought granola, but my co-workers have turned me on to the homemade variety. 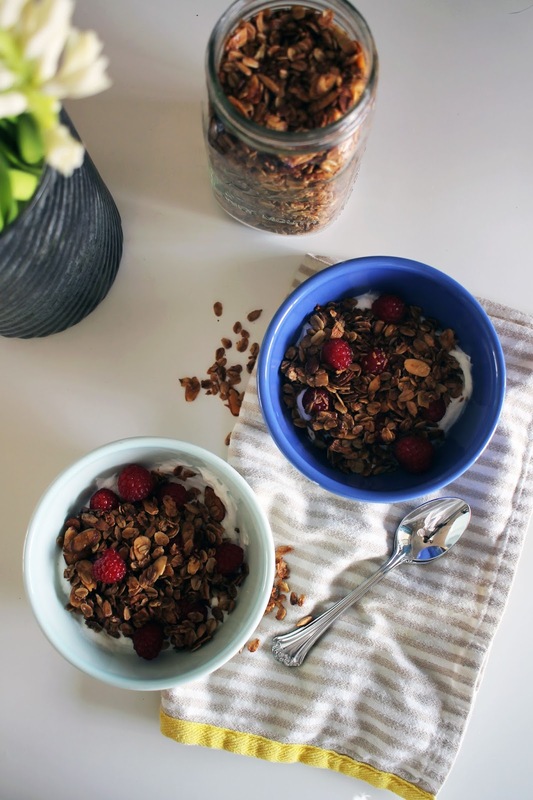 In the past my granola has always burned, but I have found that you need a generous amount of oil to keep the oats and nuts well coated. This acts as a barrier against the high heat and leaves you with a perfectly crisp, but not burned granola. 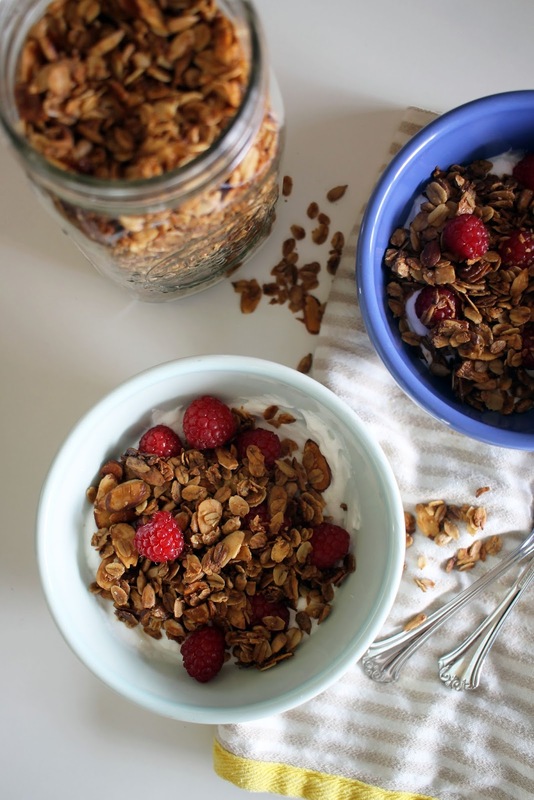 I'll probably always keep a box of granola on hand, but this sweet and salty variety is a nice treat on a tiring Wednesday morning. Preheat oven to 325 degrees. Combine all ingredients in a large bowl and stir until well mixed. Poor on to a rimmed baking sheet and bake for 30-40 minutes turning granola every 10 minuted until golden brown. Store in an airtight container. An early spring is like Christmas come early. My favorite time of the year is the first few weeks of spring when the flowers are just starting to bud and the leaves are still young and fresh. We are not quit there, but there are a few early bloomers around town that brighten my day. 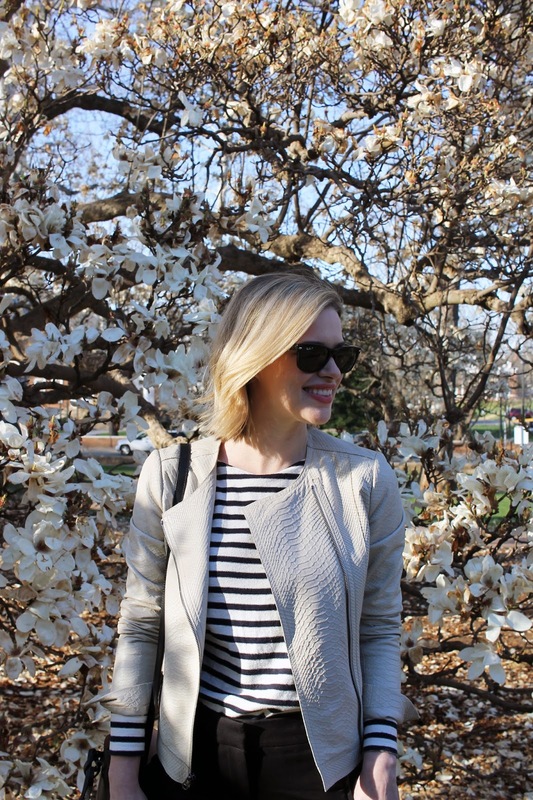 The warmer weather and longer days have me wanting to shed my dark layers in favor of a bright spring coat. Spring mornings are still chilly in Central Virginia, and after three years I finally found the perfect transitional coat. Of course I still wear it during the winter, but the light blue color is just right for a warmer day. One of my favorite trends to come about over the last year is pleated mini skirts. I love their versatilely and ability to adapt to almost any styling. I purchased one back in the fall and have worn it on multiple occasions. Right now I wear it with an oversized sweater, but a simple t-shirt or silk blouse will look great once the weather warms up. I'm even thinking I may need a new neon version for the summer. What are your thoughts on this trend? Is it here to stay, because I hope so. After covering up for months I am ready to finally shed some layers. Since it is not warm enough to go without tights these over the knee boots have become my go to. They allow me to wear a dress with some additional warmth and style. So until we reach above 70 degrees you will most likely find me in a variation of this simple outfit.